Long walks in the summer sun with your dog are a joy but whilst you are out, it is important that you protect them from the potentially damaging effects of sunlight. The light from the sun contains ultraviolet (UV) radiation which dries out and burns the skin. It is also a risk factor for some types of canine skin cancer. 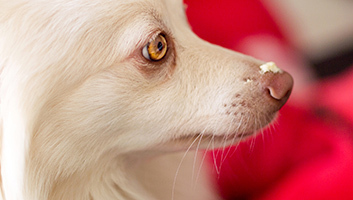 Most of your dog’s body is protected by a thick coat of fur but the nose and ears are exposed. Dogs with short coats, light hair and pale skin are also more vulnerable. You can protect your four-legged friend by choosing a sunscreen for dogs. Never be tempted to use your own sunscreen because it contains ingredients that are very harmful to dogs. Canine sunscreens are usually made from natural ingredients only. Many dog sunscreens come as sprays, balms, sticks or wipes and have ingredients to moisturize the skin. To help you decide which will suit you and your dog best, we have prepared a guide to choosing the best dog sunscreen. An ideal product for keeping your pooch safe and healthy in the bright sunlight. 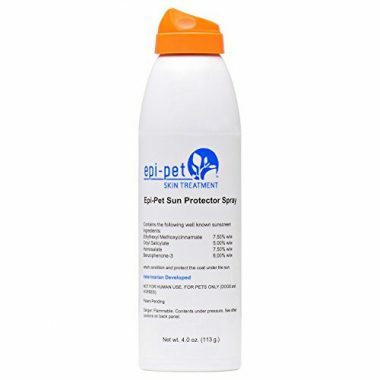 It provides useful protection from both UVA and UVB rays and is perfectly safe for dogs of all ages and for all breeds. It dries quickly and leaves no greasy residue. It is both water and sweat resistant has a pleasant vanilla fragrance that will not put your dog off it. It comes in a spray can for easy application and you can apply it from all angles. As well as UV protection, it contains ingredients to condition the skin and the coat. It will be particularly useful for dogs that are vulnerable to skin damage from the sun such as shaved dogs and those with thin, white hair. It should be reapplied every two to four hours. 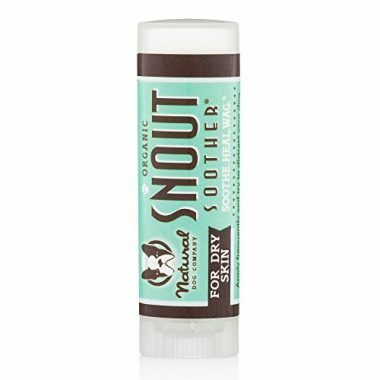 This is a totally natural product that acts like a dog nose balm and sunscreen all in one. It heals damaged skin and protects it from further damage. It is completely scent free and has natural skin protection factors (SPF) to protect from sun damage. 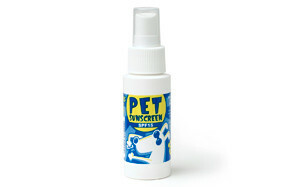 This product is perfect as a sunscreen for dog’s nose but can be used on other sensitive areas. The ingredients include organic shea butter which is a natural emollient (retains moisture) and natural sunscreen. It also contains Kukui oil which is a homeostatic moisturizer and sunscreen. There are plenty of other natural ingredients that soothe and heal the skin. It comes as a compact stick so it is easy to carry around with you. 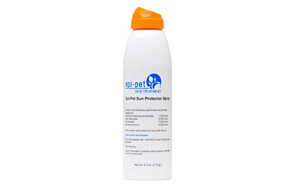 This is a dual-action pet sunscreen that both protects from sun exposure and soothes and heals damaged skin. It is in paste-form and you apply it with your fingers to exposed areas such as the nose. It is not toxic, safe and completely free from parabens. It will not cause the color of your dog’s nose to fade. It is safe for all breeds and can even be used on other animals. The active ingredients are Octinoxate USP which absorbs UV and is derived from Cinnamon oil. It also contains Oxybenzone which absorbs UV and is derived from gum benzoin. 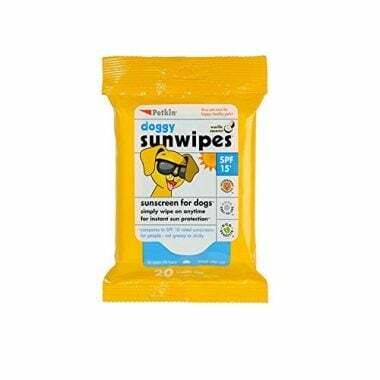 Wipes are an extremely fast and convenient way to apply pet sunscreen to your doggy. You get 20 wipes in a packet and they are moist but not greasy. They provide the human equivalent of SPF 15 sunscreen protection. The wipes contain natural ingredients that will not irritate your dog’s skin. The pack is resealable and you need to use the wipes every two hours or so. All you have to do is wipe over your dog’s ears, nose, muzzle and pink skin areas to provide instant sun protection. 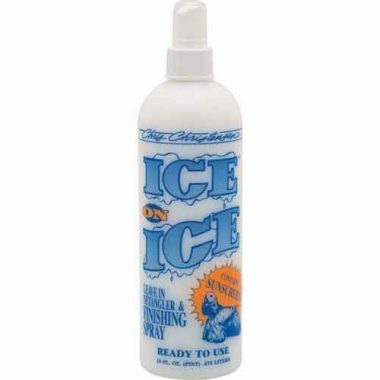 This is a spray on detangler finishing spray that you can use after bathing or grooming your dog. It’s a hair conditioner for dogs that you don’t have to rinse off because it is perfectly safe to leave in. It’s great for detangling a long coat so you can get a brush through it. It treats and strengthens your dog’s coat. By creating a protective barrier, it locks in moisture and keeps the coat looking its best. It also contains a sunscreen to protect from the sun’s harmful rays. Blended with vitamins and essential oils, this is both a sunscreen and a skin conditioner that can be used on all breeds of dogs. It is biodegradable and cruelty-free and can be used on pups as well as adult dogs. It is supplied in a spray container for easy application. It contains ingredients that will absorb UVA and UVB before they reach the skin and cause any damage. 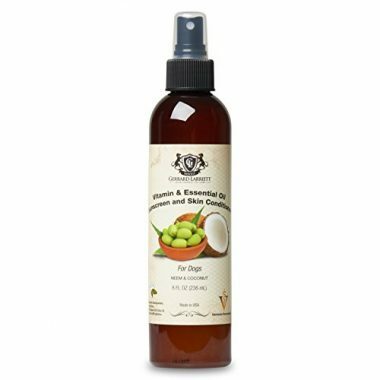 The ingredients include lavender extract, neem oil, lanolin and coconut oil which will protect the skin. 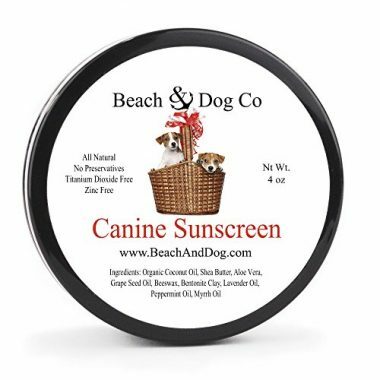 Made from all-natural ingredients, this is an effective canine sunscreen that will block the sun’s harmful rays and protect your dog’s delicate skin. It is completely free from zinc, titanium dioxide, benzophenone, and oxybenzone which can cause health problems in dogs. There are no harsh chemicals or fragrances. It contains Aloe Vera and Shea Butter which both moisturize and protect sensitive skin especially from salt damage at the beach. There’s also organic coconut oil, grape seed oil and beeswax as well as bentonite clay. The formulation includes lavender essential, oil peppermint essential oil and myrrh oil. Titanium dioxide is the active ingredient in this sunscreen which is supplied in a handy stick form that you can carry around with you. It’s a non-greasy formula that provides sun protection that is equivalent to SPF 15 in human sunscreens. There’s also mineral oil and beeswax in the sunscreen so it nourishes and moisturizes the skin at the same time as protecting it. 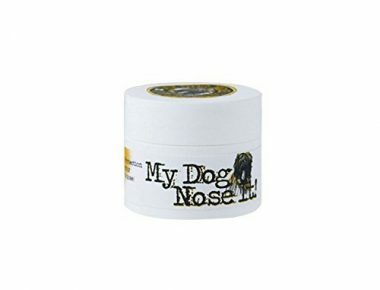 This product is an all-natural balm for your dog’s nose and any other delicate exposed areas of skin. It moisturizes the skin and can help with healing chaps and crusty noses. Soon your pooch will be feeling more comfortable. It even repels insects as well as acting as an effective sunscreen. It contains totally natural and organic ingredients which all have moisturizing or anti-inflammatory properties. Raspberry seed oil is a natural sunscreen providing protection the equivalent of SPF 30 to 50 in humans but it is also an anti-inflammatory and antioxidant. The Cedarwood oil is great for healing wounds and for repelling bugs. The carrot seed oil is also a natural sunscreen (SPF equivalent of around 30) and is great for healing skin and pain relief. It comes in a twist up tube applicator that makes it very easy to apply and you need to top it up a few times a day. There is no problem if your dog licks it because it is perfectly safe. 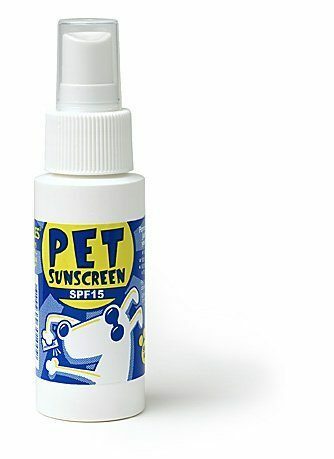 A pet sunscreen that provides your dog with the equivalent of human sunscreen of SPF 15. It comes in a handy little bottle that you can pop in your bag and is applied with a spray. It protects delicate areas of skin but also protects the coat which can bleach in the sun. It contains no silicone and is not oily to touch. There are no harmful ingredients which could irritate your dog’s skin. The most important point to make here is that you must buy a specific dog sunscreen. Do not try to use your own sunscreen on your dog even if it is labeled as safe for children and babies. It will not be safe for your dog and could make them very ill indeed. Here are some of the things that you should consider when you are buying sun protection for dogs. Sunblock for dogs can be applied in many different ways. It can be supplied as a liquid that is sprayed on, as a balm that is spread on, as a stick or as moist wipes. Liquids are best for larger areas such as the belly but a balm or stick may be best for noses. Wipes and sticks are very convenient to take with you when you are out for a walk. Dogs will inevitably try to lick the sunscreen off so it is vital that you choose one that has natural ingredients that are safe for your dog to ingest. Most are plant-based ingredients that are totally natural. Some are also organic. Obviously, it needs to have a sun-blocking capability. Natural ingredients such as raspberry seed essential oil and carrot seed essential oil are very good at absorbing the UV light before it reaches the skin. Also, some oils and butters, such as coconut oil and shea nut butter, are excellent at preventing damage caused by the sun. Many products will give a sun protection factor (SPF) value that indicates what the equivalent human SPF would be. We all know that many dogs love to get in the water, especially on a hot day. Sunscreens that are waterproof give added protection when your dog is paddling or swimming but will probably need to be re-applied once they have dried off. Dog sunscreen should not contain ingredients that could harm your dog such as zinc oxide and octyl salicylate. 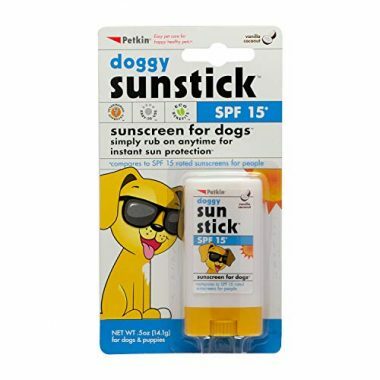 It is highly unlikely that a product targeted at dogs will contain this but it is always worth you checking yourself just to make sure that you are buying a dog safe sunscreen. Fragrance-free formulas are also preferable and are less likely to cause irritation. It is best to choose a formula that will not damage or stain your dog’s lovely coat in any way. Some sunscreens are designed specifically for their coat and prevent the bleaching effect of the sun. UV light may be a risk factor for cancer but it can also cause sunburn and can make the skin dry out. This can cause blistering and can make the skin crusty especially on exposed areas such as the nose. Therefore, it makes sense to look for a product that also has anti-inflammatory properties and that heals and soothes inflamed skin. Yes, they do. Don’t make the mistake of thinking that your dog is fully protected by their coat. Light coats can let the sunlight through and pale-skinned dogs are especially vulnerable. Also, some breeds have very thin or short coats and this is not capable of stopping the sunlight from reaching the skin. Some areas of the body, such as the belly, often have a very sparse covering of hair and so is not protected at all. There are breeds, including popular breeds such the Beagle, that are especially prone to sunburn. Don’t forget that the there are areas of your dog that are not covered by hair at all. The nose is a typical example and it is not unusual for dogs to get sunburnt noses. Sunscreen can only do so much. It can help to prevent burning and skin cancer but it cannot keep your dog cool. It is safest to keep your dog inside between 10 a.m. and 4 p.m. on the hottest days. Sunblock for dogs is available in several different forms. They all serve essentially the same purpose but have different features that you may, or may not, find useful. These are convenient because they come in a container with a spray nozzle. They are useful for larger areas such as the belly or for breeds that are hairless or have very little hair. They are absorbed easily and are usually non-greasy. Some are water-proof but it is sensible to reapply it after swimming. Balms are thicker and will stick to one part of the body. They are often used on the nose. They come in tubs which are easy to take with you when you are out and about. They often have a natural emollient so they help the skin retain moisture as well as protecting it from UV light. These are very convenient to carry around with you because they will fit in your pocket. They may also contain a moisturizing compound and cause no mess when they are applied. Very useful for owners who want to apply sunscreen without the mess of a liquid. The wipes are moist and come in a resealable pack. They are useful for wiping over ears and muzzles. Some dogs have coats that bleach in the sun and turn a lighter color. This may not be the look that you want for your pooch. You can get a leave-in conditioner or a coat spray that will protect each hair and stop the sun from bleaching it. It will also seal moisture into the hairs and keep them healthy. Some products are skin soothers that also have a sunscreen effect. They are for soothing and moisturizing dry, sore and crusty areas usually on the nose. There are ingredients that promote healing and reduce inflammation and also protect from further damage that the sun can cause. It’s not just sun protection for dogs that you need when the temperature rises and the sun is powerful. Your pooch would benefit from other measures that will offer them some further protection. The most sensible approach is to keep your dog inside a cool building between the hours of 10 a.m. to 4 p.m. This is when the sun’s rays are most powerful and the outside air temperature is at it’s hottest. Remember that it is never acceptable to leave a dog alone in a car at any time of the day or night. If you do have to take your pooch out in the bright sun, you could protect them with a dog bodysuit or vest that has sun protection. Some of these also act as cooling vests when you wet them with cold water. You can also get protective hats and dog goggles to protect their face and eyes. Some owners use a portable dog kennel or shelter that has a roof that provides UV protection. Remember that this will not protect your dog from the heat and should not be placed in direct sunlight. Q: What is sunblock for dogs and how does it work? A: There are two types of ultraviolet (UV) light in sunlight that is associated with skin damage. UVA light penetrates deep into the skin and increases the risk of skin cancer. UVB rays cause sunburn in dogs and also causes skin cancer. Sunblock needs to prevent both of these from reaching the surface of your dog’s skin. Some UV protection works by forming a physical barrier that reflects the light so it hits the sunblock and bounces back off again. This is how many human sunscreens work. They contain compounds such as zinc oxide or titanium dioxide and often create a white layer on the skin. However, these are toxic to dogs and cannot be used in canine sunscreens. Other compounds are able to absorb UV radiation through their chemical bonds. The natural sunscreens in dog products work in this way. They often also contain moisturizers so they keep the skin healthy and soft too. Q: Can I use human sunscreen on my dog? A: No, it is not safe to use human sunscreen on your dog. Human sunscreen products often contain zinc oxide and salicylates. If your dog licks the sunscreen, and it is very likely that they will, they will ingest it and it can make them very ill.
Zinc oxide is a powerful UV absorber but it can cause severe gastrointestinal issues in dogs if they ingest it. It has also been known to cause dog’s red blood cells to split apart which leads to a very serious anemia. Dogs may require an emergency blood transfusion to rectify the situation. Salicylates can cause poisoning if ingested by dogs and can be deadly if dogs ingest too much of it. Human sunscreen also contains para-aminobenzoic acid (PBA), which is poisonous to dogs if they ingest it. Q: Can a dog get skin cancer? A: Yes, sadly they can. Skin tumors are the most common type of tumor in dogs and whilst some are harmless, others are cancerous. If skin cancer in dogs is caught early enough, it can be successfully treated. Not all canine skin cancer is attributable to sunlight. Melanomas are one type of canine skin cancer that are most common on a dog’s mouth or mucus membranes. They grow very fast but are not thought to be connected to sunlight damage. Mast cell tumors are another form of canine skin cancer that has no connection with exposure to sunlight. On the other hand, squamous cell carcinoma is often connected to sunlight exposure as are malignant melanomas, hemangiomas, or hemangiosarcomas. They are all aggressive and occur most often in dogs that are over six years old. Some breeds are more prone to this skin cancer than others and they include Beagles, Basset Hounds, Collies, Dalmatians and Bull Terriers. As a general rule, dogs with shorter coats and lighter skin are more likely to get cancer associated with sunlight exposure. Squamous cell carcinoma tumors look like firm, raised warts. If you notice any unusual lumps, bumps or discolorations on your dog’s skin you must get them checked out right away by your vet. Our top pick of the best sunscreen for dogs is a liquid product that provides protection from both UVA and UVB rays and can be used on larger areas of the body. It is totally safe for dogs of all ages and contains no harmful ingredients. It dries quickly and is non-greasy and provides long-lasting water-resistant protection with a pleasant vanilla fragrance. It comes in a spray can for easy application. There are also ingredients to condition the skin and the coat. You will need to reapply it every two to four hours.